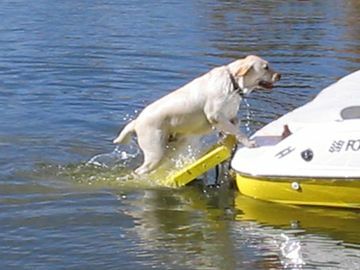 The Doggy Boat Ladder is great for any dog you want to take out in the water. 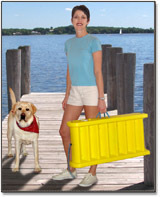 This unique dog ladder is also an excellent choice as a boat ramp for use with arthritic, older or overweight dogs. It provides an easy exit, so your dog reduces the risk of seriously straining or injuring joints. Your dog will find it easy for him to get out of the water and back aboard with this unique dog boat ladder. Easy to carry, install & store this dog boat ladder. No more struggling with a wet dog & running the risk of back injury. • Measures 16 by 64 inches, and folds in half for easy storage. The ladder features a slip-resistant ribbed design that's safe for all pets. The conveniently designed ramp will detach & float next to the watercraft when the boat ladder is needed for human use. This Doggie Boat Ladder is made of the highest quality and workmanship and built to last in all types of weather conditions. 64" x 16" x 0"
34" x 18" x 8"